The Nest Cam was a great device when it first came out, but the rest of the market has moved on while the Nest Cam has remained idle. It doesn’t offer any innovative features, and yet it still commands a sky high $200 price. 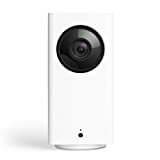 Meanwhile devices like the Wyze Cam Pan 1080p Pan/Tilt/Zoom Wi-Fi Indoor Smart Home Camera offer much better features at a fraction of the cost. It supports 1080p video, night visions, two-way audio, and other basic features that you’ll find on the Nest Cam, but it also has features like panning, zoom, Alexa support, and even automatic motion tracking.